How long do you think a professional 1 chip DLP PJ Can last? I Don't have a clue, just tell us already!! Link Posted: Tue Mar 15, 2016 3:22 am Post subject: How long do you think a professional 1 chip DLP PJ Can last? Curious on your guys' opinions on how long you think a professional 1-Chip DLP projector can actually last? I'm just throwing this out there because I've gotten in some Pro 1-chippers and a few of their hour counts surprised me. I'll tell you all how long one I have here has been running (and still does, albiet quite loudly from the amount of usage its gotten ) after this poll has been running for a week (7 days). I think a better way to phrase it is how long to the end of the rainbow? I'd say quite high. I've seen a bunch of NEC plasma pro type panels that emitted almost no light, and had burn worse than the toastiest CRT you've ever seen. My guess is that they were on 24/7, and I am sure they were over 10 years old, so that's 80,000 hours+ before they were pulled out of service. I popped the back off a couple, and it looked like they had never been worked on. As long as you can keep lamps in it. As per one of TI's papers on DMD lifespan and MTBF, the MTBF of a DMD is at least 5 million hours. Between 2005 and 2008, TI ran nine DMDs on accelerated life testing for 108,000 hours without failure, equivalent to about 400,000 normal operating life. In DLP sets, the optical path failures will relate to degradation of the optics due to bleaching and fading of dichroic optical components, adhesive yellowing and failure in cemented optical components, color wheel failure at either the motor or the adhesives holding a multi-part color wheel disc together, or age-related electronics failures such as electrolytic capacitor failure. Interesting results so far! I think all of you are going to be quite surprised with my answer. 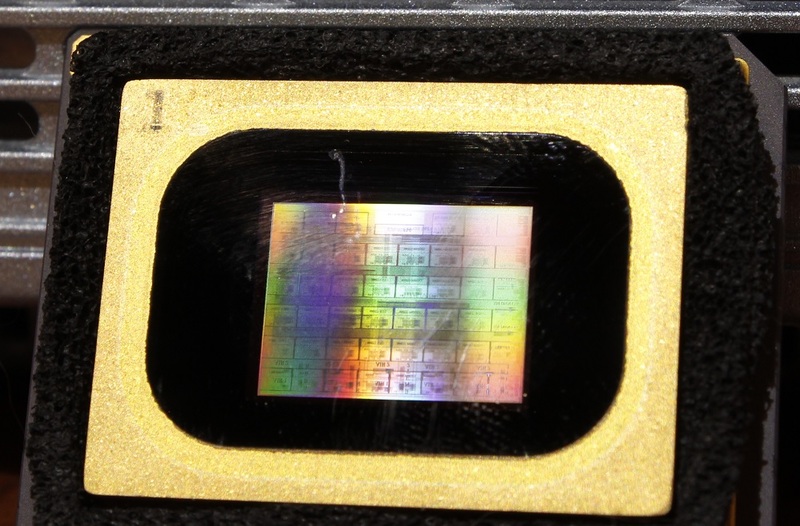 Regarding the DMD lifespan, TI must have seriously liquid cooled those DMD chips during their tests, as I've seen many many DMD failures from over-heating, poor design (poor quality lubricants on the DMD hinges resulting in stuck mirrors), and usage beyond typical projector life-spans. Ha! I've got a Pioneer 61" professional plasma display that was used for presentations in a board room, too bad they never turned the thing off or bothered to put a screen saver on the computer it was connected to. Sadly it has Windows 2000 desktop burn-in... in COLOR! Still usable if watching cinemascope movies, but for normal PC usage, the burn in is too noticable. Those of you who voted 25,000+ hours were correct. I have had several liquid cooled Panasonic 1 chip DLP sets come in with hour counts of over 26,000+ hours and zero operational issues, and thats pretty good considering some of them never get filter changes and have generic bulbs thrown in them. Edit: Yes, the DMD chip itself has actual BURN in. the micro mirrors still operate as they should, but the image being projected from this machine was on it so long it actually burned the mirrors! I wondered if TI engineered the DMD to fail after a certain point well beyond even 25K hours. I mean, how could you sell a second, third and forth unit if the first one is still running. BTW, 7.5 years of continuous use in 8 years? Was this a commercial unit? Who leaves on their tv 24x7? Also, I wonder if turning units on an off has something to do with increased frequency of failure. I do wonder though, places that buy the new laser light source PJs, I wonder if they will be willing to fork out the price for those new fangled laser bulbs after they hit their 20k mark, I'm sure those aren't cheap! Close, these were government units. I have no idea how they had them setup for usage, but I'm guessing it was some mission critical type of setup that required the use of at least one projector to remain on 24/7. To be fair the 65k projector (along with the other units like it that I have here) are all liquid cooled machines, designed for just the application they were used in. I'm sure the longevity of the 65k projector can be attributed to it being on most of its life. I have seen enough equipment that has been steadily used or "always on" that still works over the same equipment that had barely any use. It makes sense really since something thats warmed up such as a projector, will stay at that constant temperature vs getting hot and cold every 8 hours its turned on and off. less expansion and contraction of all the parts means less likely to fail. Yep... Command and control, monitoring centers, networking operations centers... I would think WanMan would be pretty familiar with the idea of a NOC since he works for a wireless carrier. I've seen 67,000 hours on a government surplus Marquee 8000 I once got from gov liquidation. I'm punching the chef in the face. Only by turning off every light and letting my eyes fully adapt to the dark could I see the hours meter displayed, and only directly on the tube face, and only on the least burned tube (red) by swapping the green video cable to the red neck card. It had about 7.6 years of continuous run time on it and the chassis was barely 8 and a half years old as per the date of manufacture. The tube burn was so bad that there wasn't even any visible pattern to it anymore. It was ALL charcoal. My guess is that it was displaying a continuous video feed from a security camera. Totally a guess. And I am sure that the machine had been retubed once or twice. A CRT projector chassis can last as long as the capacitors hold out. But digitals have a variety of age related issues, with heat and UV doing damage to plastics and adhesives and bleaching and degrading some optics. As we've seen, even DMDs can wear out. I'm thinking that D-ILA projectors using LED or laser light sources could be the ultimate winner in the longest service life without needing refurbishment category. No moving parts other than fans, and it may be possible to design one to be fanless. Oh, incidentally, that "screen burn" as you describe it may not be what you think it is. displayed frame. Which in this case was a checkerboard pattern. They will hold that pattern FOREVER, or until reinstalled and put back into service. and flaky pixes because of it, but I'll bet it'll reset if put back into a working projector. Permanent image retention on interruption of signals IS one of the characteristics of a DMD. A bit late to the reply here I might be, but what the hell. The DMD chip was actually permanantly stuck that way, it displayed what you saw on the DMD in the photo, on screen, it was quite horrible to view and totally not usable. I know what you're talking about though, when I pull DMDs out of junk PJs they do leave the last image they had on the DMD, though unlike most DMDs, the 65k hour one did not reset itself and just remained the way you see it. Jan/Feb. 2005 that 5500 was launched/demoed at ISE by Panasonic/Lang AG, liquid cooled dmd for 24/7, or was it 18/7 demoed in a metal pedestal cube rear projection shooting diagonally up.